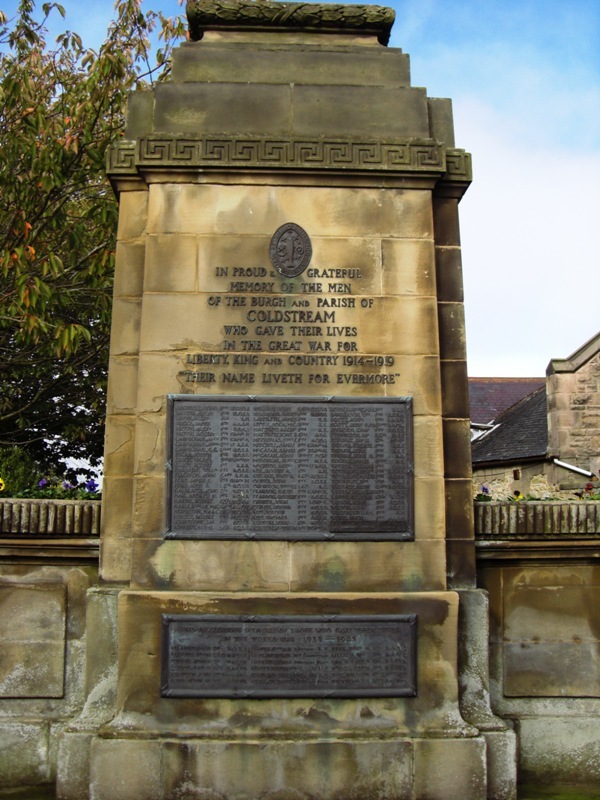 The memorial can be found at the road side in the High Street, Coldstream. 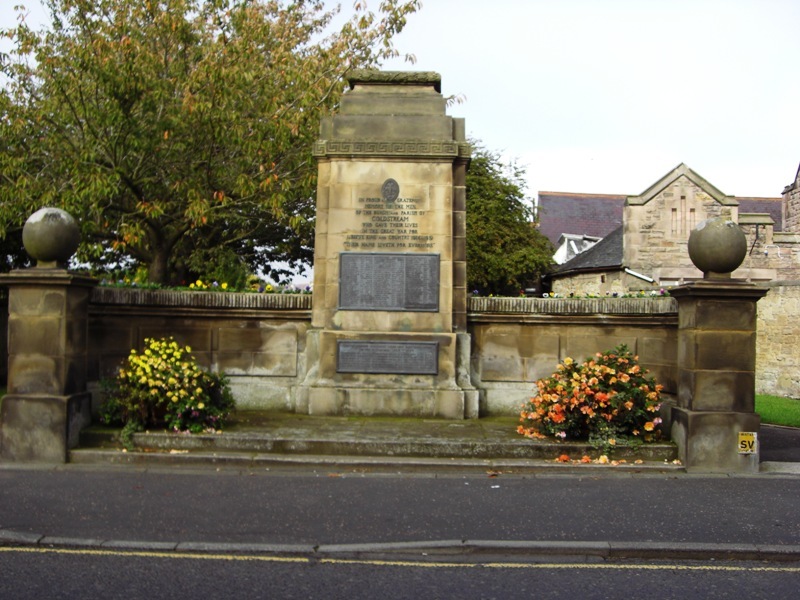 It takes the form of a stone cenotaph surmounted by a platform set into a concave wall with foot gates to the park on each side; the burgh arms are above the inscription and lower down are two plaques with dedication and names on front face fro World War 1 and World War 2. There are 70 names listed for World War 1 and 18 for World War 2. Private 18848, 10th Battalion, King's Own (Yorkshire Light Infantry). Killed in action 27 September 1915. Born and enlisted Coldstream. No known grave. Commemorated on LOOS MEMORIAL, Pas de Calais, France. Panel 97 and 98. Private 23774, 2nd Battalion, King's Own Scottish Borderers. Killed in action 18 September 1918. Aged 40. Born Sprouston, Roxburgh, enlisted and resident Coldstream. Son of Mrs. Jessie Baxter, of Coldstream; husband of Jessie Baxter, of 16, Duke St., Coldstream, Berwickshire. Buried in GOUZEAUCOURT NEW BRITISH CEMETERY, Nord, France. Plot II. Row H. Grave 6. Serjeant S/11897, 2nd Battalion, Princess Louise's (Argyll & Sutherland Highlanders). Died of wounds 17 April 1918. Aged 32. Born Kelso, Roxburgh, enlisted berwick, resident Coldstream. Son of Mr. and Mrs. Thomas Briggs, of Bowmont Forest, Kelso, Roxburghshire; husband of Elizabeth Hannah Briggs, of Hollybrae, Birgham, Coldstream, Berwickshire. Buried in METEREN MILITARY CEMETERY, Nord, France. Plot IV. Row D. Grave 644. Private 9550, 2nd Battalion, Queen's Own Cameron Highlanders. Killed in action 12 April 1915. Born and resident Coldstream, enlisted Edinburgh. Buried in CABARET-ROUGE BRITISH CEMETERY, SOUCHEZ, Pas de Calais, France. Plot XXIX. Row B. Grave 20. Private, S/22180, 6th Battalion, Queen's Own Cameron Highlanders. Killed in action 24 August 1916. Aged 24. Born Coldstream, enlisted and resident Edinburgh. Son of George Carmichael, of Eaglesheugh, Coldstream, Berwickshire. No known grave. Commemorated on THIEPVAL MEMORIAL, Somme, France. Pier and Face 15 B. Second Lieutenant, "D" Battery, 108th Brigade, Royal Field Artillery. Died of wounds 22 May 1918. Aged 26. Son of Robert Carmichael and Euphemia Bell Dickman, his wife, of Rosybank, Coldstream, Berwickshire. Born at Coldstream. Previous to joining the R.F.A. he was for six years in the Lothians and Border Horse, with which regiment he served in France and Macedonia. Buried in VIGNACOURT BRITISH CEMETERY, Somme, France. Plot II. Row C. Grave 3. Lieutenant, 1st/5th Battalion [CWGC] or 4th (The Border) Battalion (Territorial [SDGW], King's Own Scottish Borderers. Killed in action 1 August 1918. Aged 22. Son of Robert Carmichael, J.P., and Euphemia Bell Carmichael, of "Rosybank," Coldstream, Berwickshire. Buried in RAPERIE BRITISH CEMETERY, VILLEMONTOIRE, Aisne, France. Plot VII. Row C. Grave 2. Private 6794, 1st/4th Battalion, King's Own Scottish Borderers. Killed in action in the Dardenelles 12 July 1915. Born Cummertrees, Dumfries, enlisted Galashiels, Selkirk, resident Coldstream. No known grave. Commemorated on HELLES MEMORIAL, Turkey (including Gallipoli). Panel 84 to 92 or 220 to 222. Second Lieutenant, 1st Battalion attached 2nd Trench Mortar Battery, Northamptonshire Regiment. Killed in action 9 July [SDGW] or 10 July [CWGC] 1917. Aged 45. Son of the late William and Mary Elliot, of Coldstream, Berwickshire; husband of Alice Elliot. Formerly London Regiment (Artists' Rifles). No known grave. Commemorated on NIEUPORT MEMORIAL, West-Vlaanderen, Belgium. Gunner 186855 (Signaller), "A" Battery, 51st Brigade, Royal Field Artillery. Died 6 June 1917. Aged 19. Son of W. M. and I. M. Elliot, of 94, High St., Coldstream, Berwickshire. Buried in AUBIGNY COMMUNAL CEMETERY EXTENSION, Pas de Calais, France. Plot III. Row G. Grave 57. Private 4339, 1st/4th Battalion, King's Own Scottish Borderers. Killed in action in the Dardenelles 12 July 1915. Aged 22. Born, resident and enlisted Coldstream. Son of George Fairbairn, of 7, Leet St., Coldstream, Berwickshire. No known grave. Commemorated on HELLES MEMORIAL, Turkey (including Gallipoli). Panel 84 to 92 or 220 to 222. Private S/6543, Seaforth Highlanders (Ross-shire Buffs, the Duke of Albany's). Killed in action 9 May 1915. Aged 25. Born Coldstream, enlisted Liverpool, Lancashire. Son of the late Thomas Bell Ford and Marion Smith Ford. No known grave. Commemorated on LE TOURET MEMORIAL, Pas de Calais, France. Panel 38 and 39. Lance Corporal 4451, 1st/4th Battalion, King's Own Scottish Borderers. Killed in action in the Dardenelles 24 June 1915. Born Baxter, Coldstream, enlisted and resident Coldstream. No known grave. Commemorated on HELLES MEMORIAL, Turkey (including Gallipoli). Panel 84 to 92 or 220 to 222. Corporal 4414, 1st/4th Battalion, King's Own Scottish Borderers. Killed in action in the Dardenelles 12 July 1915. Aged 19. Born Swinton, enlisted and resident Coldstream. Son of Alexander and Janet Galbraith, of Gordon, Berwickshire. No known grave. Commemorated on HELLES MEMORIAL, Turkey (including Gallipoli). Panel 84 to 92 or 220 to 222. Private 4380, 1st/4th Battalion, King's Own Scottish Borderers. Killed in action in the Dardenelles 12 July 1915. Aged 21. Born Croydon, Surrey, enlisted and resident Coldstream. Grandson of the late Andrew Haig, of Coldstream, Berwickshire. No known grave. Commemorated on HELLES MEMORIAL, Turkey (including Gallipoli). Panel 84 to 92 or 220 to 222. Company Serjeant Major 18853, 10th Battalion, King's Own (Yorkshire Light Infantry). Killed in action 1 July 1916. Aged 30. Born and enlisted Coldstream. Son of Mrs. Abigail Hardie, of 2, Abbey Rd., Coldstream, Berwickshire. No known grave. Commemorated on THIEPVAL MEMORIAL, Somme, France. Pier and Face 11 C and 12 A.
Captain, King's Own Scottish Borderers attached 7th Battalion, Princess Louise's (Argyll & Sutherland Highlanders). Died 26 April 1917. Aged 21. Son of George and Annie Harle, of Dunedin Villa, Coldstream, Berwickshire. Native of Coldstream. Awarded the Military Cross (M.C.). Buried in ETAPLES MILITARY CEMETERY, Pas de Calais, France. Plot XVII. Row C. Grave 10. Private 201456, 6th Battalion, King's Own Scottish Borderers. Killed in action 3 May 1917. Biorn Eckford, Roxburgh, enlisted and resident Coldstream. No known grave. Commemorated on ARRAS MEMORIAL, oas de Calais, France. Bay 6. Private 25659, 6th Battalion, King's Own Scottish Borderers. Killed in action 20 September 1917 [CWGC} or 23 September 1917 [SDGW]. Aged 24. Born Eddington Mills, berwick, enlisted Berwick, resident Coldstream. Son of James and Agnes Huntly, of Hirsel Poultry Farm, Coldstream, Berwickshire. Buried in TYNE COT CEMETERY, West-Vlaanderen, Belgium. Plot XXIX. Row G. Grave 12. Serjeant 4020, 1st/4th Battalion, King's Own Scottish Borderers. Died 12 July 1915. Son of Robert and Mary Agnes Johnston, of The Crooks, Coldstream, Berwickshire. No known grave. Commemorated on HELLES MEMORIAL, Turkey (including Gallipoli). Panel 84 to 92 or 220 to 222. Lance Serjeant 16242, 3rd Battalion, Coldstream Guards. Killed in action 9 October 1917. Born Hartridge, Hampshire, enlisted Shepherd's Buch, resident Coldstream. Son of Robert and Mary Agnes Johnston, of The Crooks, Coldstream, Berwickshire. Member of the Metropolitan Police Force. No known grave. Commemorated on TYNE COT MEMORIAL, West-Vlaanderen, Belgium. Panel 9 to 10. [Spelt JOHNSTON on CWGC] Private 7485, 1st Battalion, King's Own Scottish Borderers. Killed in action 14 July 1916. Born and enlisted Coldstream, resident Cornhill, Northumberland. No known grave. Commemorated on THIEPVAL MEMORIAL, Somme, France. Pier and Face 4 A and 4 D.
[Memorial states Lance Corporal] Private 30024, 1st Battalion, King's Own Scottish Borderers. Died 1 May 1918. Aged 36. Born and resident Coldstream, enlisted Berwick. Son of Jane Kennedy, of Lennel Village, Coldstream, Berwickshire, and the late Peter Kennedy. Buried in LES BARAQUES MILITARY CEMETERY, SANGATTE, Pas de Calais, France. Plot III. Row F. Grave 6A. Private 351574, 9th Battalion, Royal Scots (Lothian Regiment). Killed in action 20 September 1917. Aged 30. Born Cornhill, Northumberland, enlisted and resident Coldstream. Son of Jane Landreth, of High St., Coldstream, Berwickshire, and the late John Landreth. No known grave. Commemorated on TYNE COT MEMORIAL, West-Vlaanderen, Belgium. Panel 11 to 14 and 162. [Memorial states Lieutenant] Captain, 90th Field Company, Royal Engineers. Died of wounds 17 October 1918. Aged 21. Son of John and Agnes S. Little, of Hawkslaw, Coldstream, Berwickshire. Awarded the Military Cross (M.C.). Buried in CEMENT HOUSE CEMETERY, West-Vlaanderen, Belgium. Plot XVII. Row D. Grave 6. Private 375667, 12th Battalion, Royal Scots (Lothian Regiment). Killed in action 24 March 1918. Aged 20. Born and enlisted Coldstream. Son of Peter and Agnes Matthew, of Mason's Cottage, Coldstream, Berwickshire. Buried in COMBLES COMMUNAL CEMETERY EXTENSION, Somme, France. Plot II. Row C. Grave 32. Gunner 650667, 402nd Battery, Royal Field Artillery. Killed in action 22 October 1917. Aged 23. Born Coldstream, enlisted Edinburgh. Son of John and Alice Matthew, of 6, Lukes Brae, Coldstream, Berwickshire. Buried in CANADA FARM CEMETERY, West-Vlaanderen, Belgium. Plot III. Row E. Grave 21. [Listed as Serjeant on memorial] Corporal S/7142, 2nd Battalion, Seaforth Highlanders (Ross-shire Buffs, the Duke of Albany's). Killed in action 3 May 1917. Born Maxwelltown, Kirkcudbrightshire, enlisted Coldstream. No known grave. Commemorated on ARRAS MEMORIAL, oas de Calais, France. Bay 8. Second Lieutenant, 6th Battalion, Dorsetshire Regiment. Killed in action 23 March 1918. No known grave. Commemorated on ARRAS MEMORIAL, oas de Calais, France. Bay 6. [Spelt MACDOUGALL on SDGW and CWGC] Lieutenant, 11th Battalion, Highland Light Infantry. Died of wounds 20 February 1918. Aged 27. Son of John and Mary McDougal, of Coldstream, Berwickshire. Buried in ST. SEVER CEMETERY, ROUEN, Seine-Maritime, France. Officers Plot B. Row 2. Grave 19. Paymaster, Lieutenant, R.F.A. "Hughill," Royal Naval Reserve. Died 26 April 1919. Aged 26. Son of Andrew and Isabella McQueen, of High St., Coldstream, Berwickshire. Buried in OOSTENDE NEW COMMUNAL CEMETERY, West-Vlaanderen, Belgium. Plot/Row/Sectioon B. Grave 12. Private 7229, 1st/4th Battalion, King's Own Scottish Borderers. Killed in action in the Dardenelles 4 September 1915. Aged 25. Born Eccles, Berwick, enlisted Galashiels, Selkirk, resident Coldstream. Son of Andrew and Margaret Middlemas, of 12, Market Square, Coldstream, Berwickshire. Buried in REDOUBT CEMETERY, HELLES, Turkey (including Gallipoli). Grave lost Special memorial Section B. Grave 24. Private S/11243, 7th Battalion, Queen's Own Cameron Highlanders. Killed in action 19 July 1916. Aged 20. Born Coldstream, enlisted Edinburgh, resident Colinton, Midlothian. Son of James Mitchell, of 35, Duke St., Coldstream, Berwickshire. No known grave. Commemorated on LOOS MEMORIAL, Pas de Calais, France. Panel 119 to 124. Private S/7873, 1st/7th (Fife) Battalion (Territorial), Black Watch (Royal Highlanders). Killed in action 24 October 1918. Aged 24. Born Coldstream, enlisted Edinburgh. Nephew of William Neil. of Lennel Newtown, Coldstream, Berwickshire. Buried in THIANT COMMUNAL CEMETERY, Nord, France. Section/Plot/Row A. Grave 4. Lance Corporal 24688, 2nd Battalion, King's Own (Yorkshire Light Infantry). Killed in action 2 December 1917. Aged 25. Born Coldstream, enlisted Berwick. Son of Mrs. Jane Neilans, of 45, Duke St., Coldstream, Berwickshire. No known grave. Commemorated on TYNE COT MEMORIAL, West-Vlaanderen, Belgium. Panel 108 to 111. Private 9344, 1st Battalion, King's Own Scottish Borderers. Killed in action in the Dardenelles 26 April 1915. Born, resident and enlisted Coldstream. No known grave. Commemorated on HELLES MEMORIAL, Turkey (including Gallipoli). Panel 84 to 92 or 220 to 222. Lance Corporal 49869, 12th Battalion, Royal Scots (Lothian Regiment). Killed in action 24 March 1918. Born and resident Coldstream. Formerly 2/9775, 51st Training Reserve Battalion. No known grave. Commemorated on POZIERES MEMORIAL, Somme, France. Panel 13 and 14. Private 200817, 1st Battalion, Queen's Own Cameron Highlanders. Killed in action 3 September 1916. Aged 19. Born and resident Coldstream, enlisted Kingussie, Inverness-shire. Son of the late Robert and Helen Pearson, of 37, Duke St., Coldstream, Berwickshire; brother of Robert (below). Formerly Private 4403, 1st Battalion, Queen's Own Cameron Highlanders. No known grave. Commemorated on THIEPVAL MEMORIAL, Somme, France. Pier and Face 15 B. Private 7739, 3rd Battalion, King's Own Scottish Borderers. Died in United Kingdom 23 December 1915. Born, resident and enlisted Coldstream. Son of the late Robert and Helen Pearson, of Coldstream; brother of David (above). Aged 32. Buried in the new ground in LENNEL OLD CHURCHYARD, Berwickshire. Private, Lond S. There is a John Dempster PRINGLE, Sapper 58267, 80th Field Company, Royal Engineers. Killed in action 6 August 1918. Aged 40. Born Coldstream, enlisted Darlington, Co. Durham. Husband of Frances Eleanor Pringle, of 17, Anns Terrace, Hope Town, Darlington, Co. Durham. No known grave. Commemorated on POZIERES MEMORIAL, Somme, France. Panel 10 to 14. Private 18428, 2nd Battalion, King's Own Scottish Borderers. Killed in action 30 July 1916. Born Newcastle, Northumberland, enlisted Berwick, resident Coldstream. No known grave. Commemorated on THIEPVAL MEMORIAL, Somme, France. Pier and Face 4 A and 4 D.
Private 201184, "A" Company, 1st/4th Battalion, King's Own Scottish Borderers. Killed in action in Egypt 28 November 1917. Aged 26. Born Newcastle, Northumberland, enlisted and resident Coldstream. Son of R. H. Reid, of Commercial Hotel, Coldstream, Berwickshire. No known grave. Commemorated on JERUSALEM MEMORIAL, Israel and Palestine (including Gaza). Panels 23 and 24. Private S/14594, 2nd Battalion, Princess Louise's (Argyll & Sutherland Highlanders). Died of wounds 21 July 1916. Aged 23. Born Nisbet Hill, Berwickshire, enlisted Duns, Berwickshire, resident Coldstream. Son of Helen Reid, of Somerset House, Chirnside, Berwickshire, and the late Peter Reid. Buried in MERICOURT-L'ABBE COMMUNAL CEMETERY EXTENSION, Somme, France. Plot II. Row C. Grave 12. Corporal 200317, 1st/4th Battalion, King's Own Scottish Borderers. Killed in action 1 September 1918. Aged 28. Born and resident Coldstream, enlisted Galashiels, Selkirk. Son of Mrs. Betsy Renton, of 14, Market Square, Coldstream, Berwickshire. Buried in QUEANT ROAD CEMETERY, BUISSY, Pas de Calais, France. Plot II. Row E. Grave 24. Serjeant 331, 2nd Bataalion, Seaforth Highlanders (Ross-shire Buffs, the Duke of Albany's). Killed in action 7 August 1915. Aged 24. Born Duns, Berwickshire, enlisted Berwick-on-Tweed. Son of Peter and Margaret Renton, of East New Biggen, Norham-on-Tweed. Memorial lists him as being Awarded the Distinguished Conduct Medal (D.C.M.). Buried in SUCRERIE MILITARY CEMETERY, COLINCAMPS, Somme, France. Plot I. Row AA. Grave 2. [Listed as Gilbert Andrew ROBSON on SDGW] Serjeant 16387, 15th Battalion, Durham Light Infantry. Killed in action 29 May 1918. Aged 30. Born Wark-on-Tyne, enlisted South Shields, resident Coldstream. Son of Andrew and Helen Robson, of Coldstream, Berwickshire. Awarded the Military Medal (M.M.). Buried in HERMONVILLE MILITARY CEMETERY, Marne, France. Plot II. Row D. Grave 2. Private 7555, 1st/4th Battalion, King's Own Scottish Borderers. Killed in action in the Dardelles 12 July 1915. Aged 35. Born Norham, Berwick, enlisted Coldstream, resident Norham-on-Tween, Berwickshire. Son of Mrs. Mary Sanderson, of North Back Lane, Norham, Northumberland. No known grave. Commemorated on HELLES MEMORIAL, Turkey (including Gallipoli). Panel 84 to 92 or 220 to 222. [Listed as Trooper, Lothian & Border Horse.] Sapper 65405, 56th Field Company, Royal Engineers. Killed in action 22 May 1916. Aged 29. Born Hoirncliffe, Northumberland, enlisted Coldstream, resident Mindrum, Northumberland. Son of William and Rachel Scott, of Mindrum, Northumberland. Buried in WYTSCHAETE MILITARY CEMETERY, West-Vlaanderen, Belgium. Plot III. Row D. Grave 22. Captain, Royal Army Medical Corps. Died 24 March 1919. Buried in the new ground in LENNEL OLD CHURCHYARD, Berwickshire. Private 4396, 1/4th Battalion, King's Own Scottish Borderers. Died of wounds at sea 14 July 1915. Born London, Middlesex, enlisted and resident Coldstream. No known grave. Commemorated on HELLES MEMORIAL, Turkey (including Gallipoli). Panel 84 to 92 or 220 to 222. Lance Corporal P/16648, Military Foot Police, Military Police Corps. Died 27 February 1919. Aged 32. Born Idleton, enlisted Wooler, resident Coldstream. Son of the late Andrew and Margaret Stevenson, of Wooler, Northumberland; husband of Gladys Eleanor Stevenson, of 23, Duke St., Coldstream, Berwickshire. Late of Surrey Hills, Melbourne, Australia. Formerly 29945, Northumberland Fusiliers. Buried in LES BARAQUES MILITARY CEMETERY, SANGATTE, Pas de Calais, France. Plot VIII. Row E. Grave 14A. Corporal 51083, 16th Battalion, Duke of Cambridge's Own (Middlesex Regiment). Killed in action 23 April 1917. Aged 34. Born Coldstream, enlisted Hounslow, Middlesex, resident Ileworth, Middlesex. Son of Peter and Janet Stewart, of Coldstream, Berwickshire; husband of Fanny Davidson Stewart, of 9, College Rd., Isleworth, Middlesex. Buried in TANK CEMETERY, GUEMAPPE, Pas de Calais, France. Plot/Row/Section A. Grave 21. Private 11826, 6th/7th Battalion, Royal Scots Fusiliers. Died 15 September 1916. Born Aberlady, Haddingtonshire, enlisted Helensburgh, Dumbartonshire, resident Coldstream. No known grave. Commemorated on THIEPVAL MEMORIAL, Somme, France. Pier and Face 3 C.
Private 9744, 2nd Battalion, Royal Scottish Fusiliers. Died 2 January 1919. Aged 29. Born Aberlady, Haddingtonshire, enlisted Edinburgh, resident Coldstream. Son of George M. and Isabella Taylor, of Coldstream, Scotland. Born at Aberlady. Buried in HAMBURG CEMETERY, Hamburg, Germany. Plot II. Row D. Grave 13. Sapper 153948, H.Q. Special Company, Royal Engineers. Killed in action 5 November 1916. Born Eccles, Berwickshire, enlisted Stanley, Yorkshire, resident Coldstream. Buried in LONGUEVAL ROAD CEMETERY, , . Plot/Row/Section H. Grave 15. Private 350704, 9th (Glasgow Highlanders) Battalion (Territorial), Highland Light Infantry. Killed in action 13 April 1918. Born and resident Coldstream, enlisted Edinburgh. Formerly 2293, Lothian & Border Horse. No known grave. Commemorated on PLOEGSTEERT MEMORIAL, Hainaut, Belgium. Panel 9. Private 4519, 1st/4th Battalion, King's Own Scottish Borderers. Killed in action in the Dardenelles 12 July 1915. Aged 26. Born tweedmouth, Northumberland, enlisted Galashiels, Selkirk, resident Coldstream. Son of Thomas Townsley, of 19, Lea St., Coldstream; husband of Margaret E. W. Ford (formerly Townsley), of 2, Abbey Rd., Coldstream, Berwickshire. No known grave. Commemorated on HELLES MEMORIAL, Turkey (including Gallipoli). Panel 84 to 92 or 220 to 222. Private 42237, 16th Battalion, Highland Light Infantry, Died of wounds 18 April 1917. Aged 32. Born Tweedmouth, Berwickshire, enlisted Coldstream. Husband of Christina Townsley, of 36, Duke St., Coldstream. Buried in NESLE COMMUNAL CEMETERY, Somme, France. Plot/Row/Section A. Grave 35. Captain, 4th (The Border) Battalion (Territorial), King's Own Scottish Borderers. Killed in action in the Dardenelles 12 July 1915. Son of Mr. and Mrs. J. Wallace, of 54, Joppa Rd., Portobello, Edinburgh. Of Prestonpans. No known grave. Commemorated on HELLES MEMORIAL, Turkey (including Gallipoli). Panel 84 to 92 or 220 to 222. Gunner 163248, 174th Siege II Battery, Royal Garrison Artillery. Killed in action 29 September 1918. Aged 29. Born Gordon, Berwickshire, enlisted Coldstream. Son of Mrs. I. W. B Johnston, of Nortonhall, Newtown St. Boswells, Roxburghshire. Buried in TINCOURT NEW BRITISH CEMETERY, Somme, France. Plot V. Row G. Grave 13. Serjeant 4127, 1st/4th Battalion, King's Own Scottish Borderers. Died of wounds in the Dardenelles 15 July 1915. Aged 36. Born, resident and enlisted Coldstream. Husband of Sarah Alice Martin (formerly Wilson), of 247, Tyldesley Rd., Atherton, Manchester. No known grave. Commemorated on HELLES MEMORIAL, Turkey (including Gallipoli). Panel 84 to 92 or 220 to 222. [Listed as Private, Argyll & Sutherland Highlanders on memorial] Private S/40863, 9th (Service) Battalion, Black Watch (Royal Highlanders). Killed in action 28 March 1918. Aged 19. Born Coldstream, enlisted Berwick. Son of William and Phoebe Wilson, of 2, Abbey Rd., Coldstream, Berwickshire. Formerly Private S/16342, Argyll & Sutherland Highlanders. Buried in FEUCHY CHAPEL BRITISH CEMETERY, WANCOURT, Pas de Calais, France. Plot III. Row F. Grave 3. Sergeant Iair Gunner) 1821749, Royal Air Force Volunteer Reserve. Died 5 September 1943. Aged 19. Son of Kathleen McClelland, of Coldstream, Berwickshire. Buried in BATH (HAYCOMBE) CEMETERY, Somerset. Plot 51. Sec. H. Row R. Grave 250. Rifleman 3188631, 2nd Battalion, Cameronians (Scottish Rifles). Died 1 June 1940. Aged 18. Son of George D. Ferguson and Eliza B. Ferguson, of Coldstream, Berwickshire. Buried in RAMSGATE CEMETERY, Kent. Ramsgate Div. Sec. M.A. Grave 91. Sergeant 1827160, Royal Air Force Volunteer Reserve. Died 28 October 1944. Aged 19. Son of Andrew and Agnes Ford, of Coldstream. Buried in north-east extension of LENNEL OLD CHURCHYARD, Berwickshire. Grave 195. Private 7594242, 1 Base Ordnance Depot, Royal Army Ordnance Corps. Died 17 June 1940. Aged 27. Son of Mary Lillico, of Coldstream, Berwickshire. Buried in SOULAC-SUR-MER (OLIVES) COMMUNAL CEMETERY, Gironde, France. Section Z. Grave 15. Flying Officer (Navigator) 138059, 248 Squadron, Royal Air Force Volunteer Reserve, Died 21 March 1944. Aged 23. Son of Daniel and Mary Greenshields Orr, of Coldstream. Buried in north-east extension of LENNEL OLD CHURCHYARD, Berwickshire. Grave 1155. Sergeant (Flight Engineer) 1820366, Royal Air Force Volunteer Reserve. Died 3 June 1945. Aged 20. Son of Jane Renton Brown, of Coldstream. Buried in BIRGHAM CHURCHYARD, Berwickshire. Grave 465.